Rachel Lunney of Northwest Colorado Council of Goverments goes over economic statistics durin the Vail Valley Business Forum Thursday at Colorado Mountain College in Edwards. 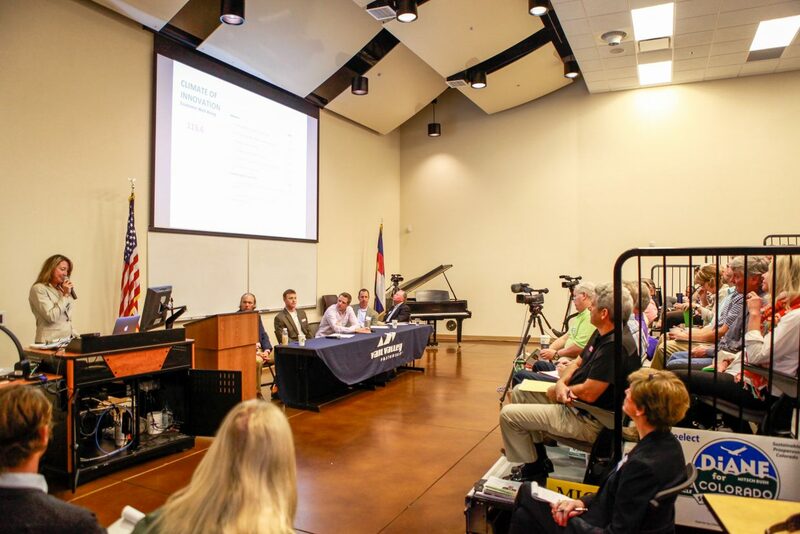 The forum was presented by the Vail Valley Partnership and the Vail Symposium. 34,377: Estimated number of jobs in the Eagle River Valley portion of Eagle County. 14.2 percent: growth in Eagle County employment since 2011. 10 percent: Projected county population growth between 2010 and 2020. Sources: Vail Valley Partnership; Northwest Colorado Council of Governments; Eagle County government. EDWARDS — The local economy is humming along at the moment, but there are some blotches in the picture. That was the overall opinion of several local experts at Wednesday’s Vail Valley Business Forum, a joint production of the Vail Symposium and the Vail Valley Partnership, the valleywide chamber of commerce. That forum provided a good look at the county’s economic picture. First, the good news: While the town of Vail’s sales tax collections recovered more quickly from the nationwide economic slump that began in 2008, the county’s sales tax revenues recovered more slowly. In fact, Eagle County Manager Brent McFall said 2015 was the first year that sales tax revenues matched 2008’s figures. But property tax revenue — the bulk of the county’s general fund revenue — still hasn’t matched 2008’s collections. Both those indicators show a recovering economy and recovering real estate values — the county’s property valuation dropped 24 percent following the slump. Job growth is more good news. Rachel Lunney, of the Northwest Colorado Council of Governments, said several areas of the local economy have shown strong growth. Employment in the construction industry has grown 7.5 percent since 2015. On the other hand, household income lags both state and national averages. And that leads to housing, which quickly became the primary topic of discussion. McFall said households that earn the county’s median income — about $79,000 per year — can’t afford a home priced at the county median of $505,000. That wasn’t the case a decade ago, McFall said. The price and availability of housing puts pressure on individuals in their peak earning years — between roughly 30 and 60 years old. McFall said people in that age group made up the bulk of households that moved out of the county in 2014. The housing crunch is affecting hiring, and hindering businesses that want to expand. Commercial real estate presents a different situation. Mike Pearson, managing broker of NAI Mountain Commercial real estate, said while vacancy rates remain fairly low throughout the valley, prices have risen quickly for commercial property, not only in the valley, but across the world. Pearson noted that a self-storage facility in Avon that sold for $4.2 million in 2012 recently sold for $7.9 million. At some point, “prices will have to come down — there’s no doubt in my mind,” Pearson said. The market will probably correct itself in the commercial real estate market. But creating more housing will almost certainly require some sort of government intervention. “That’s not to say the government shouldn’t do something,” Glass said, adding that government regulation almost always creates unintended consequences. From the audience, longtime local builder Rick Mueller agreed. Mueller noted that the county for years has had an affordable housing plan. “It hasn’t produced a single affordable unit,” Mueller said. McFall said the Eagle County Commissioners are working on a plan to ease that regulatory burden. But, Pearson said, county officials need to look deeply at rules that apply equally to those building second homes and developers who want to build apartments, arguing that county officials need to agree to put more units per acre on certain parcels. While much of the discussion centered on housing, Tom Hyatt of the Eagle County Finance Department said health care costs may be just as big an issue. “We have the highest medical costs in the nation,” Hyatt said. That’s a huge impediment to luring new businesses to the area. Pearson said competition may help moderate costs, noting that Kaiser Permanente and Centura Health have both moved into the valley recently. “Maybe that’s not the answer, but there is some relief coming,” he said.